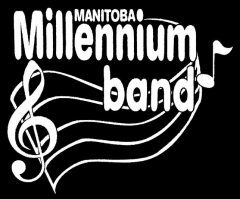 The Manitoba Millennium Band was initially created to celebrate the turn of the millennium. After which, it went on hiatus for a number of years. It was reconvened in its current incarnation in 2008, and operates exclusively during the summer months. Rehearsals generally start in May, which allows the ensemble time to learn repertoire for the season. Performances are typically scheduled from late June through August. Because it is one of the only Community Concert Bands in operation over the summer months, the Manitoba Millennium Bands attracts musicians from all over Winnipeg, who typically play in other community bands through the bulk of the year. It is a great opportunity for the musicians to broaden their musical networks by playing with different people than they normally do, as well as to experience different leadership. Our musicians are of all ages, and come from all different backgrounds. They in common the love of music, and the dedication and commitment to hone their skills. We perform at Seniors’ Residences, festivals, picnics, and are open to sharing our music wherever we may. Elizabeth Frenette grew up in Prince Edward Island. Her musical journey began early in life with a love of music being evident as a toddler. Her formal music education started at the age of 12 when she was enrolled both in piano lessons and band class, where she was assigned the trumpet. It became evident within a few months that Elizabeth’s destiny did not lay with the trumpet. Her teacher provided her with the opportunity to learn Horn. This was a much more suitable match, which has endured for over a quarter of a century and is still going strong. After Elizabeth completed her Bachelor of Music from Mount Allison University, she lived in Nova Scotia, where she was first a member, then conductor, of the Pictou County Brass and Reed Band, only departing the ensemble when she moved to Winnipeg in 2001. Elizabeth began playing in Winnipeg community bands in 2006, and has been a fixture in the adult community band scene ever since. Elizabeth assumed the directorship of the Manitoba Millennium Band in 2013, and has been thrilled with the musical growth and development, both of the individual band members, as well as her own. While she is unable to quit her day job in the field of information management for the Government of Canada, she is very passionate about music being for everyone, regardless of age or experience.